Draft: 2004, Los Angeles Dodgers, 4th rd. Luis Javier Guerra...Attended Billy Ryan High School in Denton, TX... Was a 2004 All-State selection. Began his campaign with Triple-A New Orleans where he went 3-0 without allowing an earned run over 16.2 innings... Held opponents to a .161 average (9-for-56) and went 5-for-6 in save opportunities for the Baby Cakes...Had his contract selected by Miami on July 9 and spent the rest of the season with the Marlins...Made 32 appearances from July 9 to the end of the season, tied for 13th most in the NL over that time...Stranded 15 of his 20 inherited runners (75.0%)... Left all three inherited runners on base and picked up the save on Aug. 6 vs. STL, his first MLB save since Sept. 27, 2014. Spent majority of season at Triple-A New Orleans, posting 2-4 record with two saves (four chances) and 4.70 ERA (51.2/27)...In two stints with Miami, went 1-1 with 3.00 ERA (21.0/7)...Began season with just three earned runs allowed in first 10 games (18.0 ip). Over 10-game span, worked multiple innings seven times, including a season-high 3.0 on April 11 at Iowa...Earned first win on April 15 at Omaha, working 2.0 innings. ..Recorded first save on May 11 at Reno, tossing perfect final frame...In seven April games, went 1-0 with 2.13 ERA (12.2/3). However, from May-June combined to go 1-2 with 7.94 ERA (27.1/11). Over his final 11 games with Baby Cakes, was 0-2 with 2.20 ERA (16.1/4)...Had contract selected by Miami on August 8 and made four appearances, going 1-0 with 6.35 ERA (5.2/4), before being designated for assignment on August 22...Allowed three runs in 1.2 innings in first outing with Marlins, Aug. 9 at Washington...Earned only win of season on Aug. 13 vs. Colorado, tossing 2.0 scoreless innings of relief. Marked first MLB win since September 8, 2014 vs. Oakland...Had contract selected for second time on Sept. 1 and made 12 appearances over final month, gong 0-1 with 1.76 ERA (15.1/3)...Tossed career-high 3.2 innings on Sept. 14 at Philadelphia. Previous high was 2.2 innings on Aug. 1, 2012 vs. Arizona. Made just three appearances with White Sox in 2015 before being placed on disabled list with right shoulder inflammation on April 20 (retro to April 13)...Suspended 50 games by Major League Baseball in July and missed remainder of season. Split the season between Chicago and Class AAA Charlotte after being claimed off waivers from the Dodgers on 3/26 (acquisition was recommended by Joe Butler)...Each of his 42 appearances with the White Sox were at least 1.0 IP (13 of 1.1 or more) … 33 outings were scoreless...His seven holds and four losses were career highs, and 38 strikeouts matched a career high (also 2011)...Limited left-handers to a .217 average (20-92)...His contract was purchased from Charlotte on 5/20...Posted a 0.79 ERA (1 ER/11.1 IP) in June...Made his Sox debut on 5/25 vs. Yankees (1 ER/2.0 IP)...Made six consecutive scoreless appearances from 6/2-23, striking out seven over 8.2 IP … allowed a game-tying grand slam to Nelson Cruz in the eighth inning on 6/25 at Baltimore...Recorded a pair of seven-game scoreless streaks over a 15-game span from 7/19-8/27 (1.72 ERA; 3 ER/15.2 IP)...Allowed just four hits with seven strikeouts over 6.0 IP from 7/19-8/1 and worked 8.2 scoreless IP from 8/6-27...Earned his first win of the season on 8/2 vs. Minnesota...Was on the Bereavement List from 8/16-23...His save on 9/27 vs. Kansas City (1.0 scoreless IP) was his first since 5/1/12 at Colorado (with the Dodgers)...Opened the season with Charlotte, making 14 relief appearances...Was 3-4 in save opportunities. Spent the majority of the season with Triple-A Albuquerque and allowed nine runs (eight earned) in 10.2 innings in nine appearances during his only stint with the Dodgers from April 30-May 30... Was especially tough against first batters with the Dodgers, allowing just one hit (1-for-9, .111) and striking out three in his nine appearances... Led the Isotopes with 12 saves in 13 opportunities and went 0-4 with a 3.66 ERA in 27 games (four starts) with Albuquerque…also tossed 3.0 innings in a rehab start for the Rookie-level AZL Dodgers on June 30... Went 0-2 with 12 saves in 13 opportunities and a 3.42 ERA (9 ER/23.2 IP) in his 23 relief appearances, while posting a 0-2 record with a 4.02 ERA (7 ER/15.2 IP) in his four starts with Albuquerque... Excelled in his 13 games (one start) at Isotopes Park, allowing just one run in 17.2 innings (0.51 ERA) and successfully converting all seven save opportunities... With Albuquerque, proved to be especially tough in pressure situations, limiting opponents to a .200 batting average with runners on base (15-for-75) and a .205 mark with RISP (9-for-44). Posted a 2.60 ERA in his second Major League season, ranking second on the club with eight saves in 13 opportunities. Allowed just one home run in 45.0 innings, limiting opposing hitters to a .331 slugging percentage. Did not allow a run in his last 10 appearances (12.1 IP) after July 28 and tossed scoreless relief in 27 of his last 31 appearances, posting a 1.38 ERA (5 ER/32.2 IP). Limited right-handed hitters to a .229 batting average (22-for-96) with 22 strikeouts. Posted a 2.28 ERA (6 ER/23.2 IP) with a .236 opponents' batting average (21-for-89) in 22 road appearances. Was at his best against divisional opponents, going 1-0 with three saves and a 0.42 ERA (1 ER/21.2 IP) in 20 appearances. Tossed a career-high 2.2 innings on Aug. 1 vs. the Diamondbacks...made three appearances of 2.0 or more innings this year, posting a 1.35 ERA (1 ER/6.2 IP) in those outings. Missed 30 games from June 3-July 5 due to right knee surgery and later landed on the disabled list with a left oblique strain on Sept. 3, missing the final 27 games of the season. Led the team with 21 saves in 47 relief appearances...went 2-2 with a 2.31 ERA and limited opposing hitters to a .218 batting average, including a .164 mark against left-handers (12-for-73)...allowed just 10 extra-base hits and only two home runs on the season...Successfully converted his first 10 save opportunities and his 91.3 save percentage (21-of-23) was the fourth best in the National League this season and the fifth-highest all-time mark for a Dodger...his save percentage was the sixth-best all-time mark for a big league rookie...His 21 saves tied Yhency Brazoban (2005) for the second-most all-time by a Dodger rookie, trailing only Takashi Saito's 24 saves in 2006...Posted a 0.79 ERA (2 ER/22.2 IP) with a .154 opponents' batting average and went 1-1 with eight saves in as many opportunities in his 22 appearances at Dodger Stadium...Had a season-long 11.1 scoreless innings streak over 12 appearances from July 8-Aug. 12...went 1-0 with eight saves in that stretch...allowed just five hits (5-for-39, .128) and struck out 13 in that span...Was at his best in high-pressure situations, limiting opponents to a .170 batting average (8-for-47) with runners in scoring position and a .176 mark with runners on base (13-for-74)...allowed just one hit with the bases loaded (1-for-10) and held the opposition to a .121 average (12-for-99) in close and late situations...Retired 35 of 47 first batters faced, limiting leadoff hitters to a .205 batting average (9-for-44) with three walks and 12 strikeouts...Opened the season with Double-A Chattanooga and recalled to the big leagues on May 15, making his debut that night with a scoreless inning of relief against Arizona...struck out Kelly Johnson for his first big league K...Picked up his first MLB win on June 4 at Cincinnati and earned his first save on May 24 at Houston...Went 1-0 with three saves and a 1.06 ERA (2 ER/17.0 IP) in 14 relief appearances with Double-A Chattanooga...won the April Dodger Pride Award for the Lookouts, allowing one run in 10.0 innings and saving two games in nine appearances. Went 2-0 with five saves and a 2.33 ERA (7 ER/27.0 IP) in 28 games for Double-A Chattanooga ... struck out 27 batters ... Was placed on the disabled list April 29 and missed nearly a month with a lower back strain ... cameback on May 26, but was placed on the DL again on June 7 with right bicep tendinitis ... did not returnuntil July 28 ... Made two appearances for the Dodgers' Arizona Rookie League squad from July 23-28, tossing just2.0 innings ... Pitched for the Phoenix Desert Dogs in the Arizona Fall League following the season ... allowed justtwo runs over 10.0 innings (1.80 ERA) in the AFL ... Was invited to his first Major League camp and fired 2.0 scoreless innings with the big league club. Posted a 4.07 ERA yet did not allow a homer in 66.1 innings in 31 games (three starts) for Single-A Inland Empire...Pitched for Waikiki of the Hawaiian Winter League following the season, and was named the 18th-best prospect in the HWL byBaseball America after posting a 4.24 ERA and striking out 28 in 23.0 innings in 11 games (one start). Allowed just one home run in seven starts (28.0 IP) for Rookie-advanced Ogden. Made 11 starts for Single-A Columbus, going 2-5 with a 4.96 ERA. In 11 games and 40.0 innings pitched for the Gulf Coast League Dodgers, limited opponents to a.214 batting average. Hanser Alberto lines out to third baseman Brandon Drury. 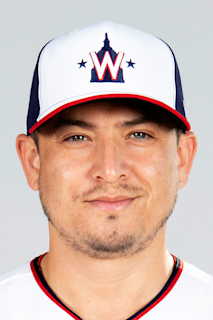 April 18, 2019 Toronto Blue Jays designated RHP Javy Guerra for assignment. March 28, 2019 Toronto Blue Jays selected the contract of RHP Javy Guerra from Buffalo Bisons. January 28, 2019 RHP Javy Guerra assigned to Buffalo Bisons. January 14, 2019 Toronto Blue Jays signed free agent RHP Javy Guerra to a minor league contract and invited him to spring training. October 12, 2018 RHP Javy Guerra elected free agency. October 11, 2018 Miami Marlins sent RHP Javy Guerra outright to New Orleans Baby Cakes. July 9, 2018 Miami Marlins selected the contract of RHP Javy Guerra from New Orleans Baby Cakes. June 2, 2018 New Orleans Baby Cakes activated RHP Javy Guerra from the 7-day disabled list. February 8, 2018 RHP Javy Guerra assigned to New Orleans Baby Cakes. December 18, 2017 Miami Marlins signed free agent RHP Javy Guerra to a minor league contract and invited him to spring training. October 9, 2017 RHP Javy Guerra elected free agency. October 7, 2017 Miami Marlins sent RHP Javy Guerra outright to New Orleans Baby Cakes. September 1, 2017 Miami Marlins selected the contract of RHP Javy Guerra from New Orleans Baby Cakes. August 23, 2017 Miami Marlins sent RHP Javy Guerra outright to New Orleans Baby Cakes. August 22, 2017 Miami Marlins designated RHP Javy Guerra for assignment. August 8, 2017 Miami Marlins selected the contract of RHP Javy Guerra from New Orleans Baby Cakes. April 29, 2017 New Orleans Baby Cakes activated RHP Javy Guerra from the temporarily inactive list. April 23, 2017 New Orleans Baby Cakes placed RHP Javy Guerra on the temporarily inactive list. April 5, 2017 RHP Javy Guerra assigned to New Orleans Baby Cakes. January 3, 2017 Miami Marlins signed free agent RHP Javy Guerra to a minor league contract and invited him to spring training. November 21, 2016 Tomateros de Culiacan placed RHP Javy Guerra on the reserve list. October 21, 2016 RHP Javy Guerra assigned to Tomateros de Culiacan. October 3, 2016 RHP Javy Guerra elected free agency. June 10, 2016 Los Angeles Angels sent RHP Javy Guerra outright to Salt Lake Bees. June 7, 2016 Los Angeles Angels designated RHP Javy Guerra for assignment. June 1, 2016 Los Angeles Angels selected the contract of RHP Javy Guerra from Salt Lake Bees. May 16, 2016 Los Angeles Angels sent RHP Javy Guerra outright to Salt Lake Bees. May 13, 2016 Los Angeles Angels designated RHP Javy Guerra for assignment. May 6, 2016 Los Angeles Angels selected the contract of RHP Javy Guerra from Salt Lake Bees. February 21, 2016 RHP Javy Guerra assigned to Salt Lake Bees. February 4, 2016 Los Angeles Angels signed free agent RHP Javy Guerra to a minor league contract and invited him to spring training. October 5, 2015 RHP Javy Guerra elected free agency. July 8, 2015 Charlotte Knights placed RHP Javy Guerra on the restricted list. May 15, 2015 Charlotte Knights placed RHP Javy Guerra on the 7-day disabled list retroactive to May 13, 2015. May 10, 2015 Chicago White Sox sent RHP Javy Guerra outright to Charlotte Knights. May 6, 2015 Chicago White Sox designated RHP Javy Guerra for assignment. April 27, 2015 Chicago White Sox sent RHP Javy Guerra on a rehab assignment to Charlotte Knights. August 23, 2014 Chicago White Sox activated RHP Javy Guerra from the bereavement list. August 16, 2014 Chicago White Sox placed RHP Javy Guerra on the bereavement list. May 20, 2014 Chicago White Sox selected the contract of RHP Javy Guerra from Charlotte Knights. March 28, 2014 Chicago White Sox sent RHP Javy Guerra outright to Charlotte Knights. March 26, 2014 Chicago White Sox claimed RHP Javy Guerra off waivers from Los Angeles Dodgers. March 17, 2014 Los Angeles Dodgers designated RHP Javy Guerra for assignment. October 21, 2013 Los Angeles Dodgers activated RHP Javy Guerra. July 4, 2013 Albuquerque Isotopes activated RHP Javy Guerra from the 7-day disabled list. June 30, 2013 Albuquerque Isotopes sent RHP Javy Guerra on a rehab assignment to AZL Dodgers. May 31, 2013 Los Angeles Dodgers optioned RHP Javy Guerra to Albuquerque Isotopes. April 30, 2013 Los Angeles Dodgers recalled Javy Guerra from Albuquerque Isotopes. March 17, 2013 Los Angeles Dodgers optioned Javy Guerra to Albuquerque Isotopes. October 15, 2012 Javy Guerra roster status changed by Los Angeles Dodgers. September 4, 2012 Los Angeles Dodgers placed RHP Javy Guerra on the 15-day disabled list retroactive to September 3, 2012. Strained left oblique. September 1, 2012 Los Angeles Dodgers recalled RHP Javy Guerra from Albuquerque Isotopes. August 21, 2012 Los Angeles Dodgers optioned Javy Guerra to Albuquerque Isotopes. July 18, 2012 Javy Guerra roster status changed by Los Angeles Dodgers. July 14, 2012 Los Angeles Dodgers placed RHP Javy Guerra on the bereavement list. July 5, 2012 Los Angeles Dodgers activated RHP Javy Guerra from the 15-day disabled list. July 1, 2012 sent RHP Javy Guerra on a rehab assignment to Rancho Cucamonga Quakes. June 4, 2012 Los Angeles Dodgers placed RHP Javy Guerra on the 15-day disabled list retroactive to June 3, 2012. Right knee inflammation. May 15, 2011 Los Angeles Dodgers recalled RHP Javy Guerra from Chattanooga Lookouts. March 15, 2011 Javy Guerra assigned to Chattanooga Lookouts. March 14, 2011 Los Angeles Dodgers optioned Javy Guerra to Albuquerque Isotopes. October 13, 2010 Javy Guerra roster status changed by Los Angeles Dodgers. August 31, 2010 Javy Guerra assigned to Phoenix Desert Dogs. July 28, 2010 Javy Guerra roster status changed by Chattanooga Lookouts. July 23, 2010 Chattanooga Lookouts sent RHP Javy Guerra on a rehab assignment to AZL Dodgers. June 7, 2010 Chattanooga Lookouts placed RHP Javy Guerra on the 7-day disabled list. May 26, 2010 Chattanooga Lookouts activated RHP Javy Guerra from the 7-day disabled list. April 30, 2010 Chattanooga Lookouts placed RHP Javy Guerra on the 7-day disabled list. March 19, 2010 Los Angeles Dodgers optioned RHP Javy Guerra to Chattanooga Lookouts. November 20, 2009 Los Angeles Dodgers selected the contract of Javy Guerra from Chattanooga Lookouts. June 25, 2009 Javy Guerra assigned to Chattanooga Lookouts from Great Lakes Loons. April 8, 2009 Javy Guerra assigned to Great Lakes Loons from Inland Empire 66ers.